With twenty years of experience in condensing in the Netherlands, M&G is an experts in supplying the right products to attach to high-efficiency condensing boilers. Already compulsory in the Netherlands, these modern condensing appliances are steadily becoming more popular throughout Europe and the rest of the world. Condensing boilers are renowned for being more efficient than non-condensing boilers, as the flue gas is kept under 60 degrees Celsius for condensation to start. The more condensation the better, as this means the maximum amount of energy is being extracted from the gas. This means there is more usable heat from the fuel burnt, which saves money on fuel bills. Plus it has the added advantage of having lower carbon emissions reducing the carbon footprint substantially. M&G supplies top quality products for the correct installation of condensing boilers. With condensing boilers this usually involves a flue gas exhaust made of synthetic materials, as the vapour has a certain level of acidity that is inert and does not reactivate to synthetic material. The innovative products designed, manufactured and supplied by M&G are recognised globally. Their in-house state-of-the-art laboratory ensures that every product is tested to not only receive the relevant certification for any country world-wide, but even exceeds the standard required for certification. M&G wants the life expectancy of their top-end products to go beyond the norm. Whereas the standard requires them to last a minimum of 15 years, M&G design their products to have long-lasting durability for up to 20 years. The system used is called Twinline PP AL INOX and Coaxline PP AL INOX. These are suitable up to 90 degrees Celsius but are able to go up to a maximum of 120 degrees Celsius. These standards are more than necessary for a condensing boiler and easily fulfil their customers’ needs. 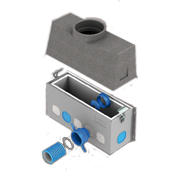 The single flue system is available in 60–200 and the flexible system is available in 60–130. Therefore they are suitable for small to extremely large condensing appliances of 5 to 500 kilowatt. 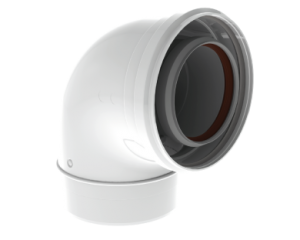 The concentric product is available in 60–100, 60–130 and 60–200 for optimal safety. M&G offer the ultimate collection of products for the condensing boiler market. 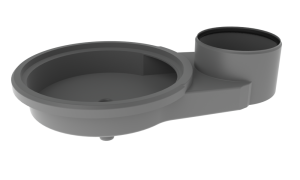 Their products are easy and straightforward to install, simple to shorten, effortless to clean and aesthetically pleasing. As they are safe, reliable and use the latest technology, they are an absolute must in any condensing project.